We already have an extension that might be pretty useful in some scenarios, but another common situation is determining what a particular thread is doing. You might want to look at instances of a particular type on the stack of a thread that is maxing out your CPU, or you might want to look at two or more threads that appear to be deadlocked. Finding one end of the stack region is very easy. The top of the stack (but the “bottom” address, since the stack grows down) should always be in the ESP register. 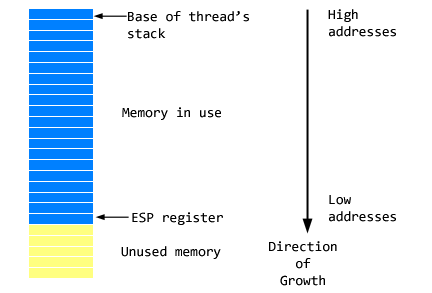 To get the base of the stack we need to be able to read an NT structure called the Thread Environment Block, or TEB. The TEB is defined as follows in the Platform SDK. We’re all ecstatic that the TEB is undocumented when this allows the kernel team to freely implement new features, I guess, but this is no help to us right now. This is closer to what the TEB header really looks like. // More fields follow but are not included here. I took that from chapter six of Microsoft Windows Internals by Mark Russinovich. He’s done many useful and awe-inspiring things besides discovering the Sony Rootkit DRM. The DbgEng SDK exposes a method to us (IDebugSystemObjects::GetCurrentThreadTeb) that makes it trivial to write a function to read in this structure in the debugger (download the source if you want to see it). We can now write a templated search function (much like those we wrote in part four) to search only the current stack. Since the stack will contain handles/pointers to the objects, we’ll also need a function that searches with a level of indirection. // Thunk the dword to a 64-bit integer. /s - Searches only the current stack. Displays statistics about ArbitraryType instances in memory. I think that’s where we’ll leave it for now. Not bad for a day of work or so, when you consider that we’re empowered to crank out similar utilities in no time at all. I hope you’ve enjoyed the debugger extension series.